Pierce Conservation District: PCD partners with schools to offer in-class lessons and field experiences related to natural resources. They are always excited to engage kids in learning about their environment through activities such as viewing aquatic life through a microscope, testin the quality of their local stream, reenactin the journey of salmon, and much more! Pacific Education Institute: OLR has been working with the Pacific Education Institute (PEI) to promote and share their Drain Rangers curriculum and FieldSTEM resources. Be sure to check these out and stay tuned for even more resources to support integrating raingardens into your classroom! 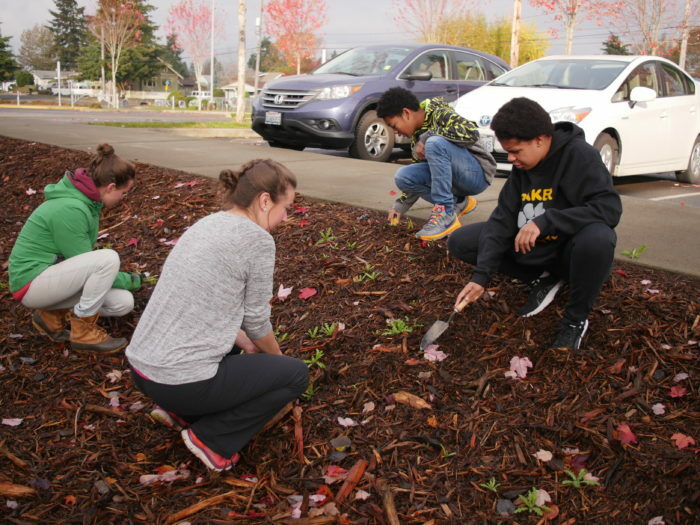 EnviroChallenger: The EnviroChallenger program teaches free, hands-on environmental lessons with a mix of science, social responsibility and fun in Tacoma’s schools (both private and public), after school events and community groups (such as Girl/Boy Scouts). All lessons support State standards and include supplies needed. EnviroChallenger instructors can visit your class to help prepare you for work in your rain garden and teach your students the ‘why’. They also have lessons about Orcas' main food supply, salmon, and how we can work together to help salmon survive. Support for Orcas Love Raingardens has been generously provided by the Puget Sound Stewardship and Mitigation Fund, a grantmaking fund created by the Puget Soundkeeper Alliance and administered by the Rose Foundation for Communities and the Environment.